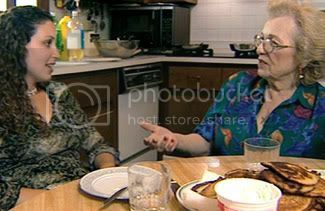 Auschwitz survivor Leah Welbel tries persuading her granddaughter Cheryl to ask Cheryl´s husband to convert to Judaism. Leah’s agony in the documentary “Out of Faith” is deeply rooted in the memory of her 33 months at Auschwitz-Birkenau. The film follows three generations of the Welbel family’s conflicts over intermarriage. It is rich in the human drama of family relationships and sharpened by the Holocaust experience, while tracing the trajectory of the American arc from immigration to assimilation. Leah, deported from her Slovak hometown at age 16 and in her mid-70s when the film was made, is the indomitable Jewish matriarch. Voluble, feisty, humorous and a born survivor, she has established a home, first in Israel and then in Skokie, Ill.
She has taught herself the intricacies of the stock market and prospered, she labors over her gastronomic specialty, potato sandwiches, and she hasn’t spoken to her grandson Danny in six years, after he married a non-Jew. Now her granddaughter Cheryl has announced that she will marry Matt, a Christian, and Leah tries a different tack. If she pushes Cheryl hard enough, Leah figures, maybe the new bride can persuade Matt to convert to Judaism. Though raised in an Orthodox home, Leah is not particularly observant, not even lighting candles on Friday evenings to mark the beginning of Shabbat. A friend has a different attitude. “If I didn’t let my son marry a Catholic, I would have lost a son,” she says. The different views toward intermarriage are reflected by the film’s producer, L. Mark DeAngelis, and director Lisa Leeman. DeAngelis, a 36-year old Chicago lawyer, businessman and now founder of Eliezer Films, grew up in a secular home. When Leah, a family friend, invited him to accompany her on a trip to Auschwitz some five years ago, he accepted and found both a subject for his film and a new attachment to Judaism. “I started wondering why, when I dated a non-Jewish girl, it bothered me, which seemed almost like a racist thought at the time,” he said in a phone interview. DeAngelis has no doubt about his viewpoint now. “If our community is to have a future in this country, Jews must marry Jews. Only that way will their kids have a shot at staying Jewish,” he said. He is now launching an outreach campaign called Keep the Faith. For details, go to www.Jafah.org. Her father was a New York Jew, her mother a Protestant of Scandinavian descent from Idaho. Neither parent was religious and Leeman thought little about her identity until she attended a meeting of the Conference of Christians and Jews. “At some point, participants were asked to divide into Jewish and Christian groups, and instinctively I chose the Jewish one,” Leeman said. As the product of an interfaith marriage, Leeman has a tolerant — or ambivalent — attitude on the topic.